For the past week I’ve been tinkering with an interesting app that was designed by poker players for poker players, the Poker Notes Live App from Cardplayer Lifestyle. The App was designed by a couple of poker enthusiasts, Alessandro Roaro and the founder of the Cardplayer Lifestyle poker blog Robbie Strazynski, and acts as a note-taking tool for live poker players. The Poker Notes Live App has two versions, a free version (the one I used) and a premium version that costs $9.99. The App is currently available for Android mobile devices, with an iOS version in the works. The free version was a 2.4mb download and is fairly unobtrusive, eating up only a little bit of battery life. 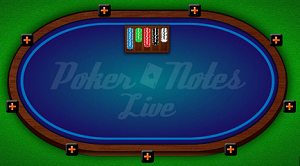 The Poker Notes Live App is available in 8 languages: English, Spanish, French, Italian, German, Russian, Dutch, and Hebrew. Essentially the app is quite similar to the note taking capabilities found at most online poker rooms, with more of a focus towards one-click entries thanks to some quick classifications like Fish, LAG, ABC, Rock, and so on. Additionally, the Poker Notes Live App acts as session tracker of your results, tracking the stakes you play, your buy-in, P&L and more. While I found the App more functional than I had anticipated, I don’t see too much of a long-term benefit in using the Free version, which I will explain shortly, but if you are a semi-serious to professional poker player it is easily worth the $10 price tag for the Premium version. Basically, if you try the free version and like it, I would just upgrade right to the premium version. The reason I say this is that the free version only allows you to take notes session by session (creating a new session deletes your previous session notes), so after each you would have to transfer them to a notebook or spreadsheet manually. Because of this you should probably think of the free version as a trial for the Premium version of the App. This feature is a chronological list of all of your sessions allowing you to click on a specific session or look at older notes you have entered. As I noticed while using the app and then researching the premium version, the premium version does everything I wanted the free version to do. The purpose of the app is to bring a bit of the online game to the live poker arena, and in this regard it works. However, it should be noted that you see far fewer hands live (and don’t have the luxury of clicking a hand history and seeing a hand that was mucked at showdown) so you don’t get the same amount of information on an opponent that you would after a couple hours online. Still, you can record some very usable information, especially on the regulars in your game. As I said above, the App was easier to use than I anticipated, and depending on how quickly you enter information may not even be that noticeable to your opponents –you’ll probably just look like someone who can’t put their Smartphone down. A secondary function is the self-tracking data you can enter into the app, which is a really nice feature. Finally, the app should help you develop your own shorthand for poker notes, which can then be carried over to your online sessions as well. First and foremost, typing on a Smartphone or Tablet isn’t the easiest or fastest thing in the world. I can actually envision scenarios where you miss real-world information because you were entering something into the App. Also, in live settings you’ll rarely know an opponent’s name and will have to enter them into the app under some descriptive, as this may become confusing if you think you’ve played with someone before and are trying to find notes on them. With that being said, the most problematic aspect of the app that I see is that some poker rooms have strict policies against electronic devices at the poker tables. If this is the case you would have to take a number of short walks whenever an interesting hand came up that you wanted to enter, or would have to enter information every so often from recall. Of less concern are players wondering why you keep fiddling with your phone, which may annoy your fellow players, especially if they find out you are writing things about them. With most Apps in $1.99 price-point the $9.99 price-tag seems a little steep, but considering how useful the Poker Notes Live App is I will probably purchase the Premium version before my next live poker game. If you play live poker even once a week I would definitely consider purchasing the Poker Notes Live App. You can find more information on the App at www.cardplayerlifestyle.com, or follow the Poker Notes Live App on Poker Notes Live Facebook page or Poker Notes Live mobile app on Twitter. This entry was posted on Thursday, July 25th, 2013 at 9:12 am and is filed under Reviews. You can follow any responses to this entry through the RSS 2.0 feed. You can leave a response, or trackback from your own site.